I just want to start right off the bat by saying this book is fantastic. 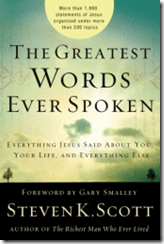 Whether you are a pastor or just someone who loves digging into God’s word, this book is a must-have reference. If you are anything like me you know that Jesus said something about something but you have no idea where it is or how to find it. 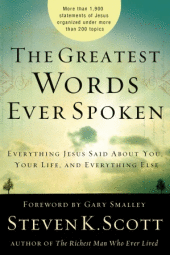 This book takes every word spoken by Jesus and puts in order by topic. It is an easily followed book that will become indispensable to you. Order a copy of it and start using a reference book that has been sorely needed. You can buy the book at Random House. Appreciate your comments on Harp and Bowl. I’ve just finished posting thoughts on worship that came out of this morning’s reading of Heights of Delight. I’m looking for a website to connect to the post and am having a hard time finding one that’s not just selling books. I’ve found yours and I like it, so, if you don’t mind, I’ll reference your site in my blog post. God bless your ministry in leading the Church toward intercessory worship!